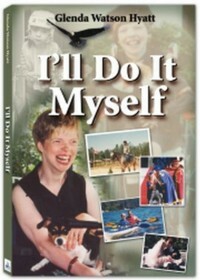 Do It Myself Blog – Glenda Watson Hyatt » Where Would I Be Without Technology? Where Would I Be Without Technology? What a week, technologically speaking! Last week my beloved word prediction and completion software EZ Keys died unexpectedly. This software saves me a fair number of keystrokes. Without it, I type every single letter. My left shoulder is screaming, my arm is about to fall off, and my wrist wants to be put on ice for a week! The tech support guy kindly offered to put a software replacement cd in express mail. That was a week ago! I understand times are tight and everything being cut back, but how long does mail from California to British Columbia take? Meanwhile, I am using Microsoft Windowsâ€™ accessibility feature StickyKeys for holding down multiple keys at once. (To find StickyKeys and other handy accessibility tools in Windows XP, go to Start > Control Panel > Accessibility Options). i am also using the free word prediction software LetMeType. 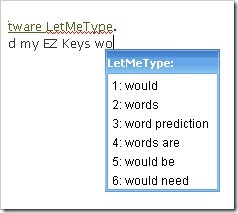 With some tweaking, Darrell was able to load my EZ Keys word list into LetMeType so that I wasnâ€™t starting from scratch. LetMeType isnâ€™t as powerful as EZ Keys. I am missing the automatic space after the software finishes typing a word, the automatic capital after I type a period, and the shortcut keys for word suffixes. But, because the LetMeType word box doesnâ€™t appear until after I type two or three letters, I can easily use the number keys and the characters above them â€“ something I am constantly fighting with in EZ Keys. LetMeType is quickly learning my language, often showing word choices with two or more words. A nice little program available for free. Then last night, while writing a lengthy comment on Wendy Piersallâ€™s post, I discovered that accidentally hitting Ctrl+shift+W in FireFox is deadly. Do not try this at home! The internet browser closes without any warning, regardless of what you were doing. 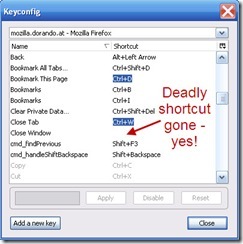 This sent me searching for a way to turn off specific keyboard shortcuts in FireFox. I found a way to turn off shortcuts, eventually! This adds KeysConfig… to the Tools menu (or the shortcut is Ctrl+shift+F12). The list of possible keyboard shortcuts can then be modified. Along the way, I discovered the FireFox Accessibility Extension, which I, of course, had to install. I suspect this toolbar will be useful in other projects that are in the works. All of this is happening while I should be frantically preparing my presentation for San Antonioâ€™s AccessCamp on February 21st. The plan is for me to present online to the group located in San Antonio and to use Skypeâ€™s text chat feature to answer questions. Right?! Discovering your website has made me happy today, so I wanted to buy you a coffee or chocolate. But the link at the bottom of your page somehow purchased your e-book! Of course I want to read the book. But perhaps that link should be fixed? David, thanks for stopping by. I’m glad you enjoyed the site! And for the chocolate, much appreciated! Consider the ebook a surprise bonus. I’ll try to fix that this weekend. Thanks Suzie. I’m blessed having you in my life! How is my week going? They don’t make that much chocolate. I love Firefox extensions, I use way too many. They seem to have them for just about anything you can think of. Glad to have you back, Wendy! Comment by Mary McDonald, the "Efficiency Doctor"
Hugs to you, speed to your replacement disk, and give Darrell a big kiss for me for helping you out! Here’s a big ‘ol pile of chocolate! Glad that the CD finally arrived!